You may be excused if you have forgotten this post series by now, as the last installment was posted back in May. Then, life interfered with my good author friend’s, William R. Bartlett’s, best intentions, so this penultimate part is only published now. It continues his discussion of all things firearms. If you have missed the rest of this brilliant series on firearms, you can check it out here. As always, Bill includes some great tips on writing about older firearms and some common writing blunders. His next, final post will continue part 6 with Flintlock weapons. Enjoy and bookmark! Thank you for all your kind responses. This is the final part in my Writer’s Guide to Firearms series and here I’ll discuss weapons for those who may want to write historical fiction. The development of firearms has continued, but, for the last century-and-a-quarter, give or take, it’s been fairly static with no dramatic changes. In that time, weapons were loaded with a brass cartridge containing a primer that ignited the propellant, i.e. gunpowder, and a projectile, also known as a bullet. One way or another, the cartridge was inserted into the chamber, the trigger released the firing mechanism (either a hammer hitting a firing pin or a striker) that hit the primer, which ignited the propellant and the resulting expanding gasses drove the projectile out of the barrel. These weapons had one thing in common: the self-contained, metallic cartridge. For our purposes, we’ll refer to all weapons that utilize this cartridge as firearms of the modern era. But, what about firearms before the modern era? How did those weapons work? What did people do when they had to use them? How did they load them? How did they make them fire? The answers go back to the invention of gunpowder, now better known as ‘black powder.’ Of course, there are exceptions, but almost all of these were loaded from the muzzle by pouring loose powder down the barrel. A projectile, usually a round, lead ball, was inserted from the muzzle and seated tightly against the powder by using a wooden or steel rod to ram the ball down the entire length of the barrel. Interestingly, this tool was known as a ‘ramrod’ and without it, or one like it, the firearm became a simple club. Even though some of these weapons were loaded from the breech, the vast majority were loaded from the muzzle and are today referred to by the blanket term of muzzleloaders. Rifling, a series of spiral grooves cut into the bore which imparted the ballistic benefits of greater range and accuracy, was invented in the mid-fifteenth century. Because of the greater length of time required for reloading, (this will be discussed in greater detail below) rifles saw limited military activity until about four hundred years after it was developed. Instead, rifles were used primarily by civilians for hunting. Whether the weapon is a rifle or a smoothbore, seating the projectile firmly against the powder was critical. A gap between the two would result in a dangerous overload of pressure that could burst the barrel. All of these weapons had three things in common: a stock, however rudimentary, a barrel, and an ignition source, that is something needed to turn the gunpowder into a quick burning fire. This ignition source became the method of identification for all of the pre-modern firearms, the matchlock, the wheel lock, the flintlock, and the caplock, also known as the percussion cap. There is a notable exception, though, that of the hand cannon, the earliest firearm. Most military weapons were smoothbores, that is the bore was smooth and had nothing in the barrel to impede loading. From the humble hand cannon to matchlocks, through wheel locks and flintlocks, continuing to the caplock (with an exception I’ll mention later) a smoothbore was preferred by the military because of speed of loading. The concept of rifling a bore hadn’t been conceived when the hand cannon was developed. However, the first rifled matchlock is generally accepted to have been made for Emperor Maximilian I around 1500. Because the method of loading rifles is similar in matchlocks, wheel locks, flintlocks, and cap locks, I’m going to discuss it once here. The process of engaging the rifling is the same, even though the ignition methods were different. One might ask the reason for the difference between loading a smoothbore and a rifle and the question is logical. A smoothbore has the expanding gasses blocked by the bullet, which is the same size (nearly) as the bore. Consequently, it’s relatively efficient in utilizing the gunpowder. The conundrum in using a rifle is how big to make the bullet? If the projectile is so small as to be easily loaded, the grooves will let the expanding gasses escape without propelling the bullet as far, as fast, or as accurately. If the bullet is big enough to block the results of the powder combustion, it would require the use of a hammer and steel ramrod to drive the projectile to the powder. Even then, the pressures may be so great as to burst the barrel at the breech. The solution was as elegant as it was simple. The bullet was made small enough to be loaded with minimal effort. However, a piece of cloth, called a patch, was placed between the projectile and the bore. The patch held the bullet securely in place and engaged the rifling, imparting the spin of the spirals onto the ball. To load a rifle, the weapon is placed in an upright position and the powder is poured down the muzzle. The patch, usually an irregularly shaped piece of cloth, is placed over the muzzle with the ball on top. The ball is driven into the muzzle, securing both the patch and the bullet, and the excess cloth is cut off with a small knife, called, interestingly enough, a patch knife. Since the patch is holding the ball in a tight grip, some force is required to drive the ball to the powder charge. (By the way, ensuring the bullet is tight against the powder is important in all muzzleloaders. A gap results in disastrous consequences, such as the bursting of the barrel and the possible death of the shooter.) 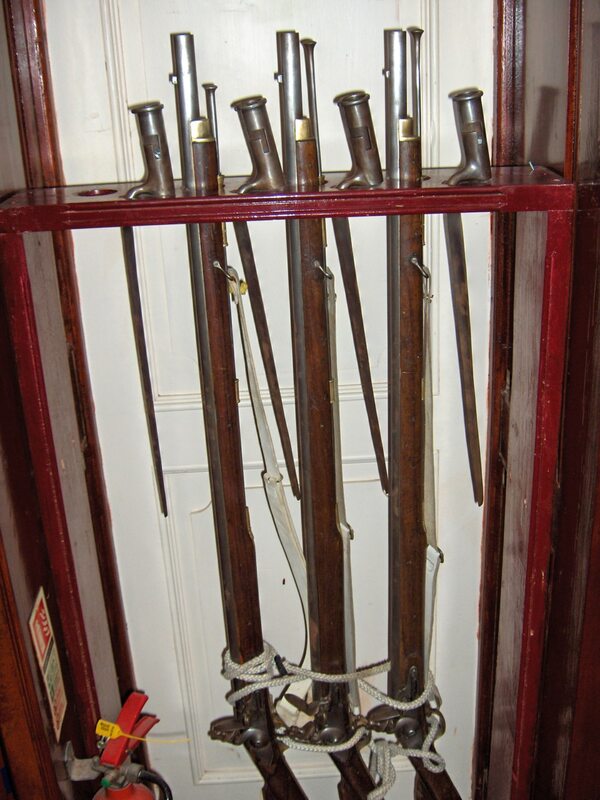 Militaries used a steel ramrod, but most of the rifles were used by civilians and their ramrods were usually of wood. To keep the wooden ramrod from splintering under the stress, a ball starter was sometimes used. The ball starter had a short ramrod of less than a foot and was designed to get the ball to a point where the wooden ramrod could be used, still with some force, to ram the ball home. A pistol was loaded in the same fashion, from the muzzle, utilizing the obvious adjustments made necessary by the decreased length of the weapon. All of this, placing the patch, starting the ball, cutting the excess patch, partially ramming the ball, and fully ramming the ball, took a great deal of time. Most smoothbores could be loaded relatively quickly, about three times a minute with flintlocks and caplocks, but loading a rifle took substantially longer, sometimes almost five minutes per shot. Military minds weighed the efficiency of rapid, massed volleys at relatively close range versus slow firing at longer ranges and, with some exceptions, chose the former. A hand cannon is the oldest type of personal firearm. It consisted of a short barrel, usually less than two feet long, with a touchhole going from the top of the barrel to the bore. Sometimes, the barrel had a length of steel attached to the rear that the shooter could use to steady the hand cannon during firing. Occasionally, the barrel was attached to a pole or, sometimes, bound with iron bands to a wooden tiller, more commonly known as a crossbow stock. 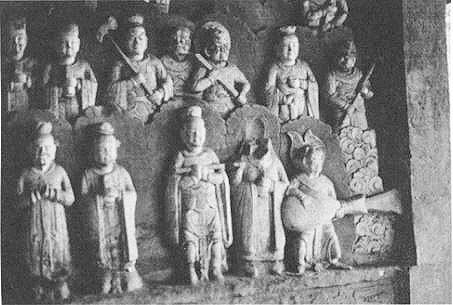 The hand cannon was the first personal firearm and became available in the thirteenth century in China. 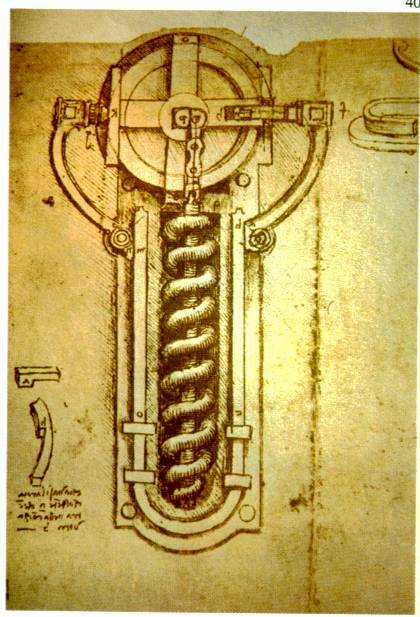 It reached Europe in the fourteenth century where it remained in use until the 1560’s. Powder was poured into the barrel, a projectile dropped in, the touchhole was primed with a small amount of powder, and some source of ignition was held to the touchhole. 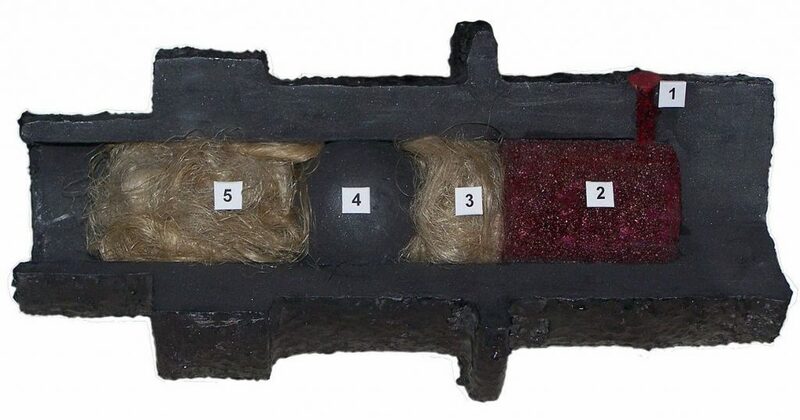 There are some accounts of using a red-hot iron wire to ignite the charge, but this seems unlikely as a fire would need to be near the shooter to keep the wires hot enough to ignite the powder. Some portable heat source, a reed or cord of some sort that would burn slowly as an ember, seems more probable. If the shooter was lucky, he might hit his target. It was quick and easy to learn. The alternatives to firearms were either a crossbow or a full-sized wooden or composite bow. To achieve mastery of the bow took years of constant practice. Even a crossbow took months to obtain an acceptable level of skill. The hand cannon could be taught in an afternoon, and the shooter could obtain proficiency within a single day. The noise and smoke from the device could frighten horses and lower the morale of troops facing the weapon. The ignition source was external to the weapon and could be extinguished with a passing shower. The technology for a precision-made barrel didn’t exist and the projectile, sometimes, just a spherical rock, didn’t fit the bore well. This lack of precision resulted in poor accuracy and short range. Embers left in the barrel after firing could result in a premature ignition with potentially disastrous consequences for the shooter. Aiming at a target. Hand cannons had no sights and could not be aimed. The shooter pointed and hoped for the best. Long range shots. The barrels were short, the tooling was crude and accuracy over fifty yards or so was limited by the technology. Not accounting for the tiller. Hand cannons were, by and large, a forged iron tube with a piece of forged iron, or tiller, sticking out the rear. Most often, the hand cannon was steadied by holding the tiller under one arm. Lead ball ammunition. While chunks of spherical lead were preferred, arrows were sometimes fired from hand cannons. Occasionally, even rocks were used. Using a torch to ignite the powder. While an external ignition source was required, an open flame such as a campfire or torch was an invitation to disaster. A bit of glowing twig or, more often, a piece of cloth cordage, soaked with something to keep the ember alive, also known as a match or a slow match, was more frequently used. Shooting in inclement weather. Black powder simply does not ignite when it’s wet. Technology progressed, as it is wont to do, and the matchlock supplanted the hand cannon with a more ergonomic wooden stock and better provisions for sighting the weapon. The match for which the weapon is named is something of a misnomer by modern standards. Instead of a self-igniting piece of small wood, the match of the time, sometimes called a slow match, was a slow-burning cord that varied in length, but could reach up to a yard or more. 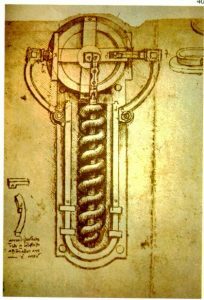 The cord could be cotton rope, hemp rope, or even tow, the broken fibers from a mixture of hemp and flax, soaked in a saltpeter solution and left to dry. After the match was lit from a fire, it kept burning in a slow, steady ember, obviously decreasing the length as it was consumed. A leather bandolier, carrying twelve wooden containers, (called the Twelve Apostles) each with a premeasured amount of gunpowder, and a pouch for the projectiles was frequently worn by shooters, although many bandoliers held more than twelve containers. device called a serpentine in front of the pan. The shooter lifted the piece to his shoulder, opened the pan cover, and pulled the trigger. 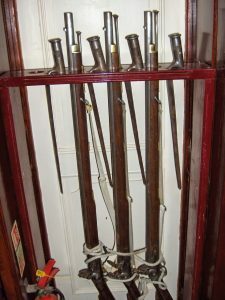 Unlike modern firearms where the spring is designed to keep the firing pin moving toward the cartridge, the spring on a matchlock was designed to keep the serpentine holding the slow match away from the powder. Therefore, pulling the trigger required a constant pull to overcome the force of the spring to lower the slow match onto the powder in the pan. When the ember in the slow match encountered the powder, it ignited and sent a jet of hot gasses through a small hole in the side of the barrel, the touchhole, where it ignited the main powder charge and propelled the bullet downrange. The shooter then released the trigger, which pulled the serpentine with the slow match away from the pan, removed the match from the serpentine and stowed it, still burning, on his hip, away from the baldric and the powder. At this point, the matchlock was ready to load again. The stock gave greater stability to the weapon, allowing for greater accuracy. The slow match was a reliable method of ignition with great portability. A matchlock is heavy. 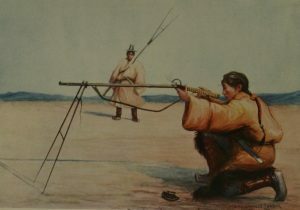 Historical paintings frequently show the use of a prop, called a musket rest, being carried with the weapon. In addition, the slow match must be kept burning. If the match was to go out or be depleted, the matchlock becomes a rather awkward club. As technology increased and finer tolerances became possible, cleaning the weapon became more important. Black powder is dirty and leaves a great deal of a sooty residue, which can build up to the point where a bullet cannot be rammed down the barrel. Not blowing on the slow match. The match has to be hot to ignite the powder. The shooter could literally stir the powder in the priming pan with a cold ember and it will not ignite. Shooting without a slow match or with a match that has been extinguished. No fire, no shoot. Forgetting to seat the ramrod, or scouring stick, as it may have been called. Without the ramrod, the musket cannot be loaded and becomes as stated before, a rather awkward club. Not opening the priming pan cover prior to shooting. The match has to land in the powder. Not keeping the burning match on the side opposite the powder. Most people are right-handed and would keep the powder on the right side. This means they’d keep the match in a loose coil on the left side, away from the powder. If the ember came into contact with the powder outside the priming pan, it would be a bad day for the shooter. Not using a shooting prop. While this is arguable (modern videos of people demonstrating a matchlock seldom use a shooting prop), in paintings dating back to those days, the shooter is almost never portrayed without one. Loading a matchlock musket while mounted on a horse. Loading a matchlock is a multi-step process that takes both hands. In addition, keeping a slow match burning while on horseback may be difficult, to say the least. Wheel locks were a quantum leap forward in firearms technology. Developed about three hundred years after the hand cannon, the wheel lock was the first firearm with a self-contained ignition source. The principle was very similar to a modern cigarette lighter. A toothed wheel made of steel was rotated while a piece of rock, usually iron pyrite, was held against it, producing sparks. The sparks ignited the powder in the priming pan, sending hot gasses through the touchhole and igniting the main powder charge. In practice, it was a little more complicated. Before loading powder and ball through the muzzle, some gunpowder was placed into a priming pan and covered with a lid. A small spanner wrench rotated the wheel and built up the spring tension needed for the wheel to turn. 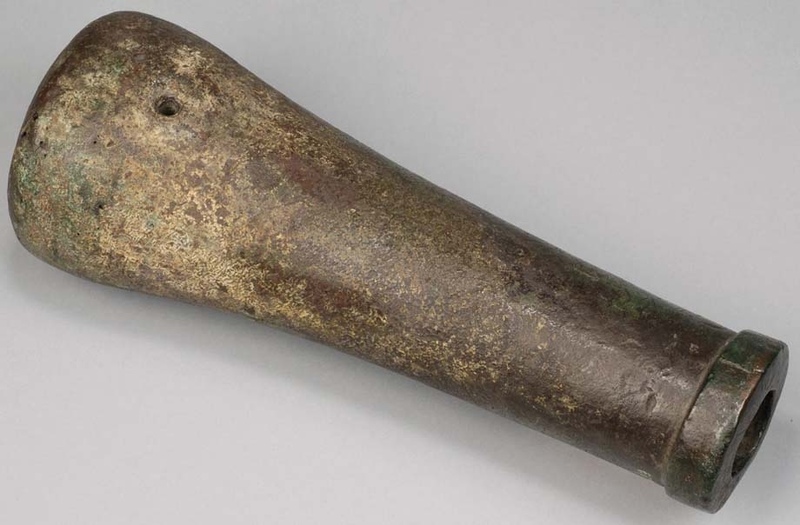 The hammer, actually a vice called a ‘dog’ and not spring loaded, was manually moved to be in contact with the wheel from its place forward of the priming pan, placing the weapon into battery. When the trigger was pulled, the wheel spun against the iron pyrite and produced sparks which landed in the priming powder. The powder in the pan ignited and hot gasses passed through the touchhole in the side of the barrel, igniting the main charge and driving the projectile downrange. 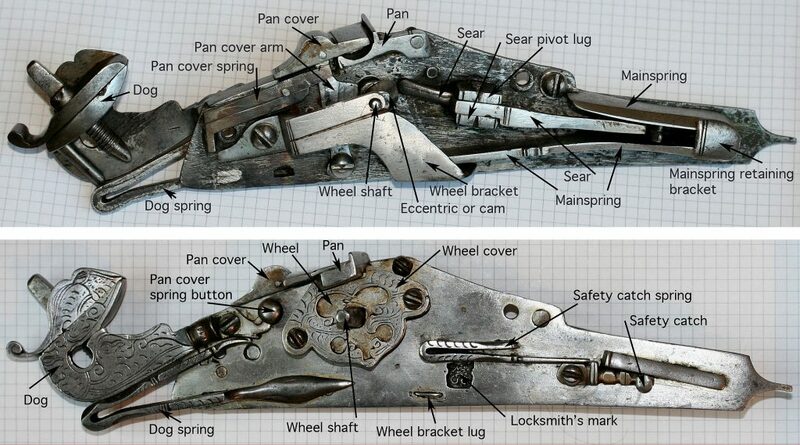 Although the wheel lock existed at the same time as the matchlock, it seems to have been primarily a cavalry weapon. The precision workmanship needed to make them function may have been too expensive to equip the average infantry soldier. More importantly, while loading was just as complicated as loading a matchlock, maintaining the ember of a slow match while on horseback was considered too complicated and could be dangerous for both the horse and rider. The wheel lock allowed for the weapon to be placed into battery far in advance of need, a feature required by the cavalryman. The weapon can be loaded in advance of need and still deployed in an instant. The wheel lock had no need for an external source of heat to ignite the propellant; everything necessary to fire the gun was self-contained. The fine precision needed to manufacture the weapon made it delicate, easily broken, and especially susceptible to fouling. This degree of precision led to another disadvantage: the wheel lock wasn’t cheap. Examples that have survived show exquisite workmanship with detailed inlays of contrasting materials and precious metals. Combined with the interior workings, this drove the price to impractical levels for the average infantry soldier. Not cranking the wheel to set the spring. If the wheel isn’t cranked, (a small, spanner wrench was supplied just for that purpose) there’s no way to get the spark needed to ignite the powder. Not opening the primer cover. The primer cover is closed after filling it with powder to keep the powder from spilling out during the rest of the loading procedure. In addition, a wheel lock can be carried loaded for some time before it’s employed as long as the primer cover is in place. However, if the spark can’t get to the powder, the powder can’t ignite. Not setting the dog on the wheel. This is a separate manual operation and goes along with opening the primer cover. The dog does not automatically fall on the wheel when the trigger is pulled. I hope this helps with your writing. The next, and last, installment will continue part 6 with Flintlock weapons. Thank you, Kim. I’m honored that you found this piece worthy of posting on your blog. Thank you, Charles, that was kind of you to say. I hope you find it helpful. You’re welcome Happy to share and I’m sure everyone who uses firearms in their stories will appreciate the info. Another outstanding weapons post. I have some people with matchlocks in my next publication, but they’re on the opposing side, so we don’t explore them much. I intend to revisit this in a subsequent story, and will remember some of the finer points here. Thank you, Craig. I can’t tell you how pleased I am that I’m able to help. I love historical fiction and anachronisms ruin it for me. It sounds like you are not the type who will allow anything that’s not appropriate for the time period to sneak into your work. Well done. Thank you for your generous words and I hope all you write goes viral. I try to get things right. This was a great series, and hope it helped a few people understand that you don’t have to pump a side by side, or rack the action on your 1911 for every shot. I forwarded here the whole series, but this is better for me as a writer of historical novels. Thank you, Marina. I love historical fiction and I’m glad I’m able to help. Thank you, Don. I’m glad I’m able to help. Many thanks, Anna. I’m flattered that you chose to share this on your blog. Thank you, so much. I’m glad you chose to pass this on to your readers. I hope you and those who enjoy your blog will find it helpful.